Early or not, Mississippi’s corn crop is well on the way to its best yield in years, barring any major disasters. 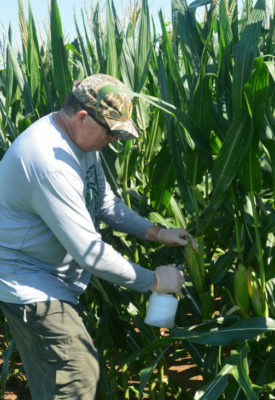 Erick Larson has spent more than two decades as the Mississippi State University Extension Service corn specialist. Larson said 2017 weather generally has been better than he can remember for any past growing season. Timely rains in some areas and cool nights during the crucial early grain-filling periods were important keys. Larson said he sees promise for strong yields in dryland corn as well as irrigated fields. Larson said Mississippi’s corn benefitted from much better planting conditions than in the last four seasons. Growers planted most of the state’s corn from March 20 through mid-April, which is an ideal time. The crop germinated quickly and established uniform stands, which are critical for high corn productivity. “We generally had drier than normal weather in March, April and May, allowing for effective nitrogen fertilizer applications, weed control and deep root system development in most of the state,” he said. Dennis Reginelli, an area Extension agent based in Oktibbeha County, said corn in the heavy soils of east Mississippi has had more than enough rain. When the corn crop reaches maturity, grain development is finished and the crop dies. Beyond that point, the weather is not a factor in crop development. Weather may affect harvest, but the hot, dry weather common in August is favorable for corn harvest. The forecast for upcoming yields has a significant impact on market prices. Extension agricultural economist Brian Williams said corn prices have suffered from more acreage and strong supplies following the 2016 harvest. The recently released World Agriculture Supply and Demand Estimate has caused some additional volatility on corn prices, with lower old crop feed use and higher new crop ending stocks. Last year, Greenville cash price for corn was $3.68 per bushel, and the futures price was $3.50 per bushel. This year, on July 13, the cash price was $3.69 per bushel, and futures were $3.76 per bushel. Mississippi corn growers averaged 166 bushels per acre in 2016. This year, they planted 560,000 acres, down from 750,000 acres last year. Nationally, corn growers planted almost 91 million acres, compared to 94 million acres in 2016.